If you’re looking for an exact number we should tell you that there are way too many variables and scenarios that will affect a specific result, therefore we have to be absolutely honest: we can’t give you an exact answer for every integration 😔. Basic filters - they, in fact, consume a low amount of API calls due to the volume of handled data. Advanced filters - these might imply a higher API consumption. 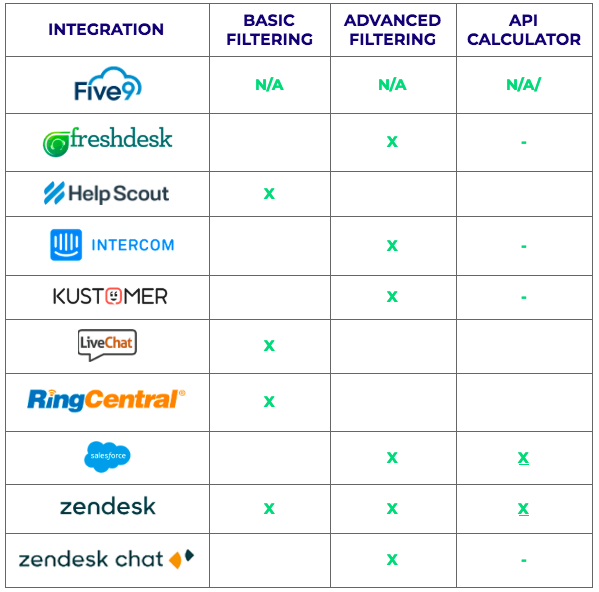 *Each integration defines its filters and API consumption differently. 2. Interaction types and details: as you might know, each customer can have their CRM interactions structured differently as far as default data and content details (attachments, notes, etc.) go - depending on how your integration works, it might require a single API call to request all the related data or it might require a call per detail. Since each integration has its own parameters when it comes to API consumption, we strongly advise you to check out the API calculator of your integration (FYI - not all integrations have a calculator - check table below). Do you have any additional questions? Just let us know… you can either leave a comment, ask on our chat or contact your AE/CSM directly. NOTE: About the data we process, it is transmitted using encrypted TLSv1.1 and higher over HTTPS and data at rest is kept encrypted using industry standard AES-256 on EBS Volumes in Amazon Web Services (AWS) facilities in the USA.